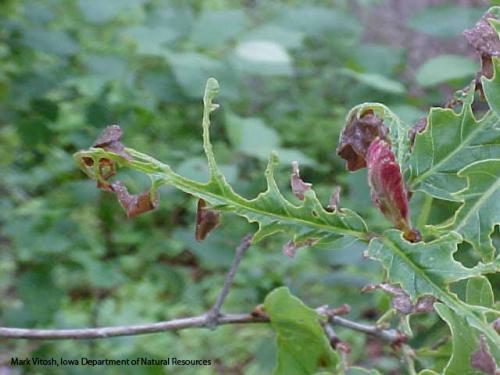 In recent weeks there have been a significant number of calls and samples to the Plant and Insect Diagnostic Clinic and to Iowa DNR/ Forestry Bureau District Forester offices on concerns about the leaf condition of tree species such as white oak and hackberry. People describe the impacted leaves as having veins without leaf tissue, brown leaf tissue between the veins, and looking kind of lacy and tattered. Often people indicate that the leaves look like they have been eaten by insects or that they suspect the leaves have been infected with anthracose (a fungal disease that causes irregular tan spots on leaves). They also mention that impacted trees look very thin and void of leaves from a distance, while other species around them look green and healthy. 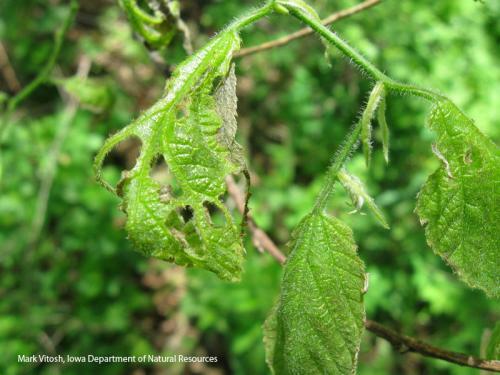 This leaf condition landowners have been reporting is often called “tatters” and it has been consistently reported in Iowa since the mid 1990’s. 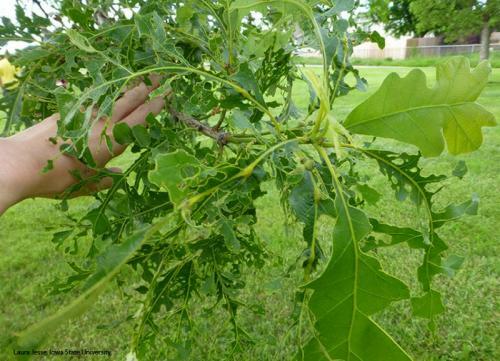 In general, this problem as been reported mostly on species such as white oak, but in recent years it has also been observed on red oak, bur oak, black oak, pin oak, and the non-oak species hackberry. This symptom shows up in the spring time as leaves begin to emerge. In most cases, the new leaves emerge in the spring looking normal and when they are between 1/4 to 3 inches in length the leaf edges and tissue between the veins becomes brownish or purplish in color, and within 1 to 2 weeks the damaged tissue falls off and tatters symptoms appear. This symptom has been reported on trees of all ages, size, and locations (urban and woodland settings). These tatter symptoms are more commonly reported in rural areas. In some cases the same tree will show the symptom in repeated years and others will have the symptom one year and not the next. Generally, within 3 to 6 weeks heavily impacted trees will produce a new flush of leaves to replace damaged leaves. The new flush of leaves usually does not show the tattered symptom. In the long term, trees that are impacted in repeated years by this problem could become more susceptible to stress related problems such as borers or root rots. There is no direct research evidence at this point that the tatters condition has caused tree death, but there is concern that it maybe causing stress to impacted trees. 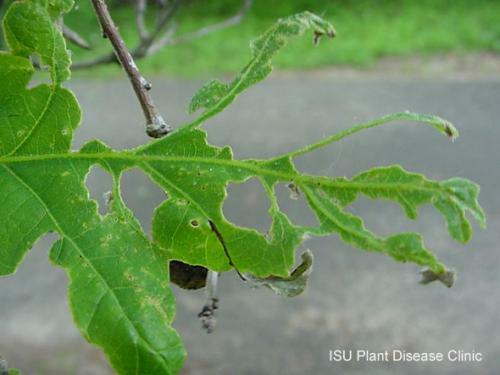 Two common theories related to the potential cause of the tatters condition on oaks and hackberry are herbicide drift and cold injury, or a combination of both. There have been no specific studies looking at cold injury and leaf tatters on specific species. A 2004 study at the University of Illinois indicated a possible link between tatters and the movement of specific agricultural herbicides when leaves are unfolding in the spring. In woodland situations very little can be done to help trees impacted by tatters, but in urban situations providing a healthy growing environment and avoiding other stresses (i.e. construction damage- cut/fill/compaction) can potentially help trees stressed by tatters.